There is some naive charm to be found in Crack in the World, a thoroughly silly disaster film that owes less to real science than to science fiction. The movie starts off with a ridiculous premise and then spends the rest of the running time topping it again and again. Married scientists, Dana Andrews and Janette Scott are preparing to explode a thermonuclear bomb miles down in the Earth's crust in order to release the supply of magma underneath. This magma will be used as a source of energy for the entire planet. So, yeah, it's not bad enough to blow up nukes on the surface of the planet, now there are those who want to nuke the Earth from the inside out. Of course, there is the one scientist who doesn't agree with this plan, played by Kieron Moore, and of course he used to have a thing for Scott years ago. Oh, and Andrews also begins suffering from some unnamed disease that causes him to wear rubber gloves, to put his arm in a sling and to begin wearing sunglasses indoors. Anyhow, the bomb is dropped, it goes boom, and what do you know? It ruptures the Earth's crust and causes a giant crack to begin racing across the face of the planet and the destruction of the human race is imminent. Of course, we have to put aside the knowledge that there are already many cracks in the Earth's crust already and magma already reaches the surface all over the place. How destructive is this *gasp* Crack in the World? Apparently it is causing untold death and destruction all over the planet. I say 'apparently' because we never get to actually see any of this. The only evidence is provided by a couple of television newscasts that use old stock footage, as well as the occasional message sent down 'on the wire' that tells us what's happening. In fact, the only clue to the damage is a shot of a squirrel trying to escape some flaming trees. The movie gets even sillier when the scientists believe they can stop the crack by, get this, exploding another bomb. Unfortunately, this new explosion only serves to cause the crack to reverse course and head back to the original science lab. And once it does make a complete circuit, a huge chunk of the Earth's crust will be hurtled into space. Never for a second do we believe anything about this story, but so what? Andrews is over-the-top entertaining and Scott is likable and appealing, and the finale with the destruction of the underground science lab is well done and does provide some excitement. Although the hurtling chunk of Earth moment could've and should've been handled better. 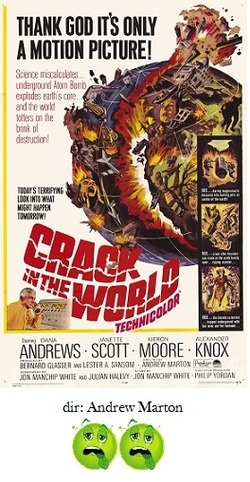 Crack in the World is just plain goofy, and it only serves as an interesting artifact from the era of the Cuban Missle Crisis where the fear of worldwide nuclear destruction was very, very real. There's innocent fun to be had here, just don't take....well, anything....about it seriously.